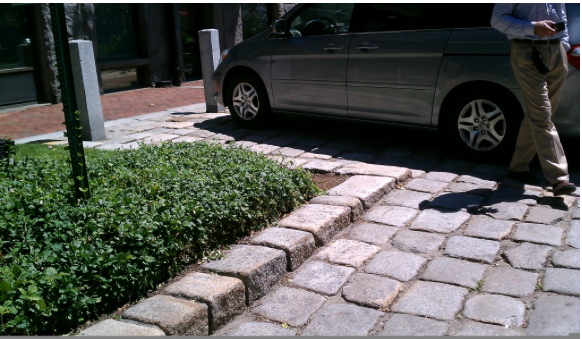 Most people are familiar with cobblestones and have a good idea of how they can be used and what they look like. I am always on the hunt for reclaimed cobblestones that are a different, shape, color or size, something unique. Last week I was walking down near the Boston waterfront and I came across this installation of antique cobblestones. Wow I have seen nothing like these before. These beauties have worn tops and range are all at least 12x12x12. Truly unique. Wish I could find a bunch of these to reclaim! We at Stone Farm love reclaimed cobblestones. The worn patina and subtle colors and textures speak to their timeless history. Whether harvested directly from an old street or town in America, to a quaint village in Europe, these cobblestones have a story to tell; a history to be discovered and preserved.